The Game of Thrones bug seems to have bitten political parties and pollsters alike. While Congress used memes based on the popular HBO teleseries to target Prime Minister Narendra Modi and the BJP, the Press Information Bureau and Election Commission rode piggyback on it to urge voters to exercise their franchise. The BJP was not to be left behind with party MP Anurag Thakur using the posters of the teleseries to announce ‘Modi is Coming’, utilising the popular tagline ‘Winter is Coming’. Congress used the hashtag “BJP Game of Thieves” to attack the BJP and its leadership, including former Karnataka chief minister B S Yeddyurappa over his purported diary noting alleged payoff to the top party leadership. Congress’ Games of Thrones meme had Modi in the foreground as the Night King. 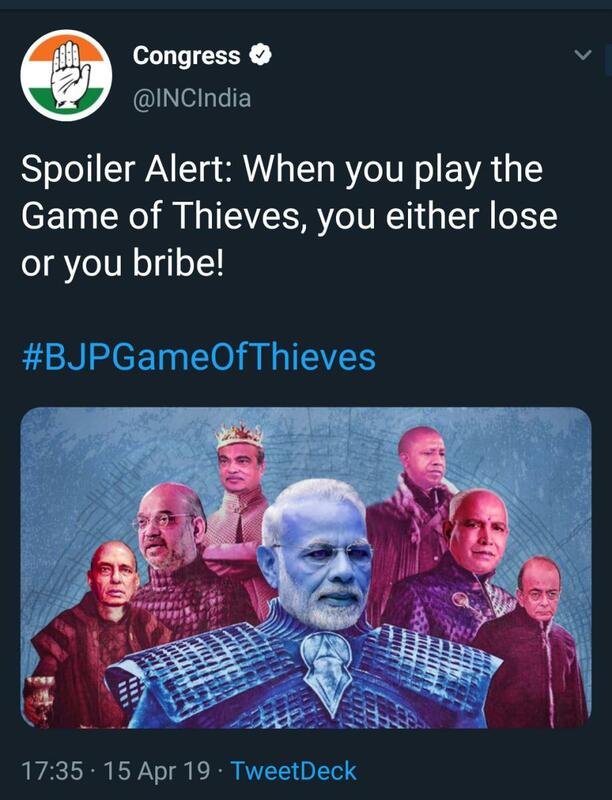 “Spoiler Alert: When you play the Game of Thieves, you either lose or you bribe,” a rip-off of the popular line: "When you play the game of thrones, you either win or you die". The PIB used memes based on popular characters from the series Tyrion Lannister and Hodor. “Not all heroes hold weapons... some just hodor vote,” the PIB tweeted urging people to vote in huge numbers. “No matter how big or small one is, every vote has equal power. This #LokSabhaElections, become a true hero. Go OuT and vote... #ItMatters,” the PIB said. The DMK was not to be left behind and released a three-minute video recapping multiple plotlines from the teleseries to hit back at the BJP-AIADMK alliance in Tamil Nadu.